Fast forward – In 1999, after years in the computer, oil and gas, and the restaurant industries (among others), I became a saddle fitter. The reason? Every time I put my saddle on my horse in those days I would apologize to him because I knew that it didn’t fit and I didn’t know how to make it fit. I just prepared myself for discomfort; for him and for me. Yes, I did learn how to ride the bucks and push him through the short striding but I also knew that as most horse owners eventually figure out, that there was a serious knowledge gap in my horsemanship. Eventually, light dawned and I knew I had found my calling. 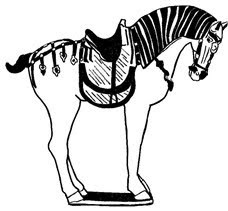 Thanks to the Master Saddlers Association and County Saddlery, since 1999 I have been proud to be a member of an elite group of horsemen who strive to start with the horse. If the horse isn’t comfortable under saddle, then I can help with the saddle and make him more comfortable, thus making the rider more comfortable so they can both have more fun. After working with thousands of horses, I’ve discovered that fixing both the obvious and the not-so-obvious things can make huge differences: from the design of the saddle tree and panels to the length of the browband to the tightness of the noseband. I will be posting more on my “News from Alice and Justin” blog in the near future. There will be lots of current news from my clients, saddle fitting tips plus other interesting tips that I've come across on my saddle fitting adventures. Keep in touch with me and we’ll share our journeys together -- I love learning from my two-legged and four-legged friends! Justin, Stats: 1990 TB Gelding, Dark Bay or Brown, show name: “Just Ask Me”, registered name: “Fox Man Red” (See http://www.pedigreequery.com/fox+man+red for his details) 16-3 hands, 1450 lbs (true!) and the biggest set of equine lips known to man. Periodically, I’m going to share some stories about my horse, commonly known as “The Boy,” “J-Man,” “GoofBall,” “Ol’ Fox Man”, “My Bud” and other not-so-flattering names. He’s my guy. He’s my bud. He pushes my buttons and makes me laugh. I go home from the barn relaxed and happy, frustrated and puzzled, and often, just plain delighted. I purchased him from Bob Lucas, a wonderful friend and Kansas breeder who had him at Arapahoe Race Track in Aurora, Colorado in 1993. He was U-G-L-Y but wondrous. He had bad feet, a huge head, good legs and the most interesting personality I’ve ever seen in a horse. Always thinking. We were mildly successful in the hunter ring, not so successful in the dressage ring and then, thanks to Laura Backus, finally discovered our true calling: eventing. He loves galloping and cross country jumping but some soundness issues forced us away from the fences so now we simply do our best in the arena and try to have some fun. He developed Cushings (PPID) in 2007 so there will be lots of updates on that situation as well on these pages. I’ll be posting some funny (and not so funny) stories about “The Boy” on this blog. Check back for his latest adventures!